The Black Hills of Imperial County, California, at the far eastern edge of the Colorado Desert (part of the northwestern Sonoran Desert), host quite a number of well-known deposits of geodes and nodules, including the Hauser Geode Beds, the Hidden Saddle Beds and the Straw Beds. To my knowledge, however, none of them honors the host range in their names. 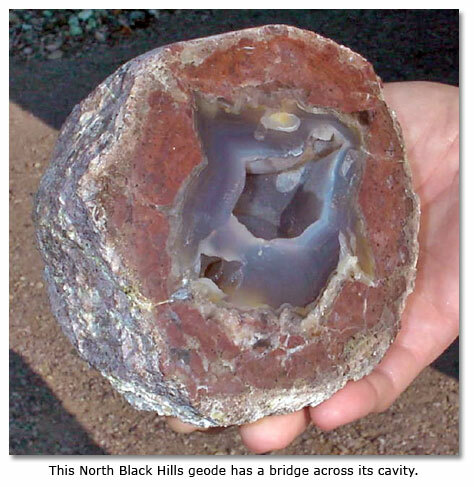 Thus, when it came time to name the geode beds near the northern extreme of the Black Hills, I thought they should be called the North Black Hills Geode Beds. Of course, someone else may have beat me to the naming process and not yet publicized the fact. If so, to that person I offer my apologies. This would not be the first time a mineral-collecting site had two  or more  names, at least temporarily. The site has been known by rockhounds for decades. I talked with one who said that as far back as the late 1950s he and some friends had pulled a number of large geodes from the wash that bisects the site, including several that were the size of a basketball. Additionally, a low hill on the west side of the wash shows evidence of considerable digging, all of it fairly old. The North Black Hills Geode Beds do not appear to be as extensive as the far better known Hauser or Hidden Saddle beds, but from all indications, they cover a sizable area just the same. Moreover, the site seemed to be promising enough that in the late 1980s someone put up claim markers, hoping either to mine the thundereggs (a popular name for geodes and nodules) successfully or to charge rockhounds for the privilege. Because any such plans apparently did not materialize, it is possible to collect geodes and nodules at the location todayat least until someone buys the land or begins mining and puts up “No Trespassing” signs. On the way to the site, rockhounds frequently locate nice pieces of brown jasper, red jasper (including some with thin but attractive seams of black agate), and cream-and-orange colored picture sandstone, all of which usually is found as float. Some of it is of excellent quality. At the collecting site itself, thundereggs are the main attraction. Both geodes and nodules often contain black fortification agate, although certainly not with the frequency that they do at the nearby Black Agate Thunderegg Mine. 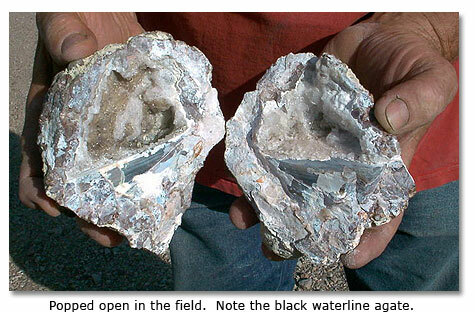 Some contain waterline agate. Quite a number have white opalite cores. I have also seen a few  perhaps a dozen in all  that have had pretty pink and raspberry colored opalite interiors. Those who would like to visit the North Black Hills Geode Beds should be aware of the fact that the area is remote and that, at the collecting site, they may not see another person for weeks on end. Therefore, be sure that your vehicle is in good condition and that you have all the supplies you may requireespecially water. Four-wheel drive may not always be needed, but it is recommended. The best insurance against vehicular failure  or getting stuck  is to have a second vehicle along. To get there, a GPS reader will prove to be highly useful. From the Wiley’s Well exit on Interstate Highway 10 located some 16 miles west of Blythe, California, drive 2.9 miles south to the end of pavement at a stop sign at 33°34.183' N and 114°53.882' W. The paved road turns right to two state prisons, Chuckawalla Valley and Ironwood. A small sign indicates camping ahead. Continue southward another 5.9 miles on a graded dirt road. This road can be quite washboarded. About 0.2 mile south of the entrance to the Wiley’s Well Campground, you will reach the intersection of Wiley’s Well Road and the Bradshaw Trail at 33°29.457' N by 114°53.278' W. Turn right and drive west 6.7 miles on the Bradshaw Trail, an old gold-rush road dating to the early 1860s. At 33°27.338' N by 114°59.480' W, immediately east of where the Bradshaw Trail dips down through a wash, a little-used road forks to the left. Turn left, and continue in a generally westerly direction, past the power line and its access road at 33°27.035' N and 114°59.925' W. For the next 4.2 miles, both brown and red jasper are often found as float. About 1.7 miles from the Bradshaw Trail, at 33°26.403' N and 115°00.846' W, is a crossroad marked by a rock cairn. This is the old Palo Verde-Niland road. Beginning about a quarter mile west of this junction and continuing for about 1.5 miles, it is possible to find interesting and attractive, cream-and-orange colored picture rock. Approximately 3.7 miles from the Bradshaw Trail, you may note the old, rusty remains of a refrigerator on a hill to your right. This is not as unusual a sight as one might imagine. Desert dwellers often used refrigerators  operating or not  to store food and anything else they wanted to keep safe from desert rodents. On a little rise on the left, you may see a rusty, abandoned van. Two roads lead to it. Avoid them! About 0.1 mile beyond these relics, at 33°25.646' N by 115°02.722' W, a road leads off to the left. Stay right. Some 4.4 miles from the Bradshaw Trail, at 33°25.316' N by 115°03.188' W, go through a wash. Note the outcrops of bright red and purple solidified rhyolitic mud just downstream. On the far side, bear right. A scant 0.1 mile beyond, at 33°25.286' N by 115°03.202' W, you will reach another junction. Again, stay right, following the road on the eastern bank of the wash. Picture rock can be found as float in this area, and the hills immediately to the left have yielded a number of thundereggs. As far as I know, they have all been collected from the surface. At the next junction, about 4.8 miles from the Bradshaw Trail, you need to take the left fork. It is located at 33°25.024' N by 115°03.443' W, or thereabouts. The road ends at the North Black Hills Geode Beds, 5.7 miles southwest of the Bradshaw Trail. Your GPS reader should put the location at 33°24.438' N by 115°03.526' W. While the excavated area is not large, thundereggs can be located as float throughout a wide area. Those found on the desert pavement tend to be small, usually from about an inch to three inches in diameter. Those dug out are easily twice that size, from about three to six inches in diameter, and I have seen several that exceeded twelve inches in diameter. Such large ones have been dug from several spots to the south of the parking area, and also from a spot across the wash. 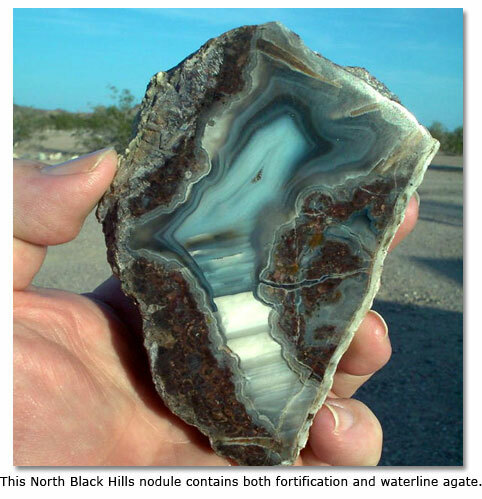 In addition to geodes and nodules, look for seams of black agate. Some of the area rhyolite has black agate, white chalcedony, and various different hues of opalite running through it. The pecky and birdseye varieties, especially, make attractive slabs and cabs. Serpentine and perlite can be found as well, but, aside from fairly small pieces, nearly all that I have examined have been of poor quality and too fractured to work with any hope of success. 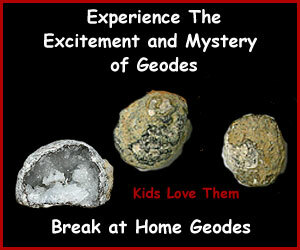 Those who plan to dig for geodes should be aware that relatively little digging will be in soft volcanic ash. In fact, even when digging in ash in this area, it probably will have been compacted to almost rock hardness. So, along with your rock hammer, shovel and carry bag, bring a drill and heavy hammer, a pry bar and a good pair of work gloves. You will need them. Note: Rockhounds planning to dig for thundereggs at the North Black Hills Beds should be aware that mountain lions appear to have a dens nearby. In 2003 one was spotted crouched in the rocks part way up the ridge at the eastern edge of the site, watching with interest a rockhound who was digging below. It appeared to be well fed and in excellent condition, so it probably was only curious, but that may not always be the case. Be aware of your surroundings and watch out for yourself, your children and your pets. The author Delmer G. Ross, is a Professor of History, La Sierra University.